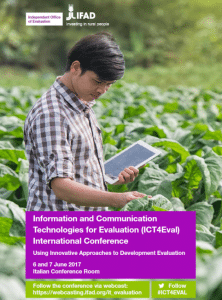 SurveyCTO has been selected to participate in the Information and Communication Technologies for Evaluation (ICT4Eval) International Conference in Rome on June 6-7. Hosted by the Independent Office of Evaluation of the International Fund for Agricultural Development (IFAD), the conference will focus on innovative approaches to development evaluation. For those of you who are new to our technology, SurveyCTO is an ODK-based data collection platform that has been used to collect millions of submissions in over 130 countries by organizations such as the World Bank, International Food Policy Research Institute, Innovations for Poverty Action, OXFAM, Harvard University, and many others committed to rigorous evaluation in rural economic development, agriculture, health, education, and other sectors.